Computer generated animation is great, but I still appreciate the hand drawn cartoons from my childhood. 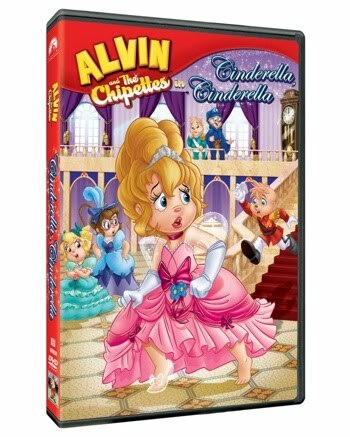 This recently released DVD Alvin and the Chipettes in Cinderella Cinderella brings me back to those days. 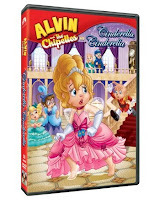 This particular DVD contains 3 fun 22-minute episodes starring Alvin and The Chipmunks and The Chipettes. The first is "Cinderella, Cinderella", which tells the tale of Brittany dreaming that she is Cinderella and Alvin is the Prince. The second is "Alvie's Angels", which is a spoof on the 70's show Charlie's Angels. "The Brunch Club" has a loose connection to the movie The Breakfast Club. One great thing about these episodes is the music. Songs sung by these lovable characters include Aretha Franklin's "Respect" and Survivor's "Eye of the Tiger". There was also references to Indiana Jones in "Alvie's Angels", which was fun. One thing I did not care for in that episode was the overly-accurate depiction of Alvie's (Charlie's) affinity towards beautiful women. This episode actually showed cartoon women in bikini's, one of which was bending over so her backside was facing Alvie and the audience. So it is up to you if you think this is appropriate for your children. It did stand out to me, but I do not think it would keep me from allowing my children to view this DVD again in the future. This DVD retails for $16.99 and can be found on Amazon.com and at select retailers of children's DVDs. Thank you to Click-Communications for sending us a sample DVD free of charge to base this review upon.